‘Black Knight’ is a variety that has been around Australia and New Zealand for at least 30 years. It has not seemed to be found in the Northern hemisphere although I think there are now similar plants. Who knows who its parents may be although guaranitica and ‘van Houttii’ have been around a long time and may be responsible. ‘Black Knight’ has clumps of canes around 2m high and has a long flowering period of deep purplish maroon often depending on the age of the canes. It will flower well in winter if cut down in summer and there is no frost. Frost will tip it but it can be grown under an evergreen tree for protection, it will still flower well in a fairly shaded position. 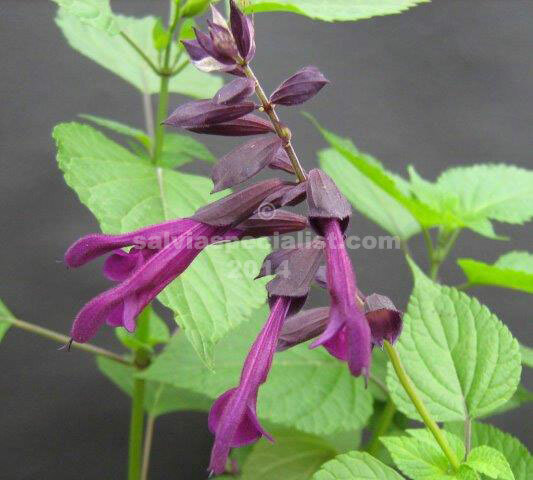 The closest salvia to it is ‘Desley’ which no doubt has ‘Black Knight’ in its genes. Black Knight is a name likely to be applied to other plants and has been applied to the deepest purple salvia leucantha which could cause some confusion. Leucantha foliage is greyish and felty.